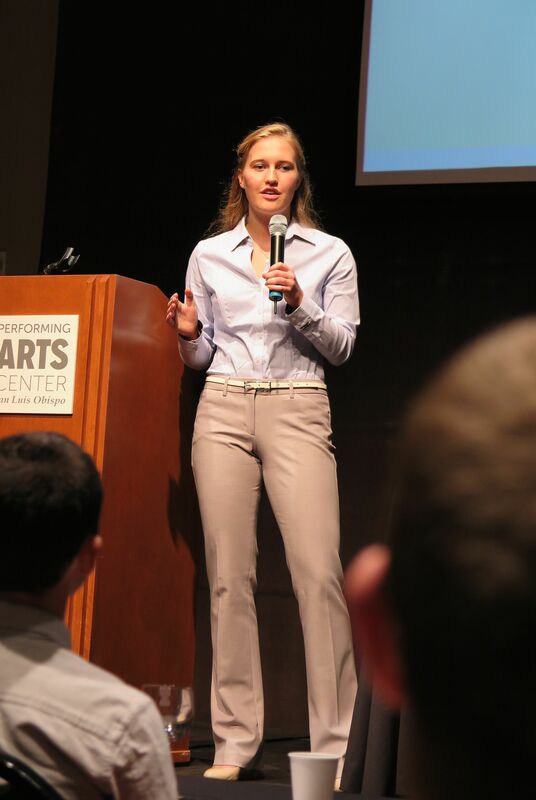 Students, alumni and faculty from the Orfalea College of Business gathered at the Performing Arts Center for Cal Poly’s first Entrepreneurship Forum of the academic year, hosted by the Center for Innovation & Entrepreneurship. The event attracted campus-wide participation in the student pitch competition and a panel discussion on the entrepreneurial journey. The final round of the 5th annual Ray Scherr Elevator Pitch Competition was the highlight of the evening. 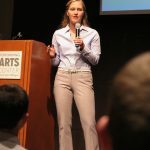 Of the 282 video pitch submissions, 10 finalists ranging from freshmen to graduate students were selected to pitch their big idea in just 90 seconds. Two business students were among the entrepreneurs on stage in the preliminary Idea Cloud division and more mature Launch Pad categories. 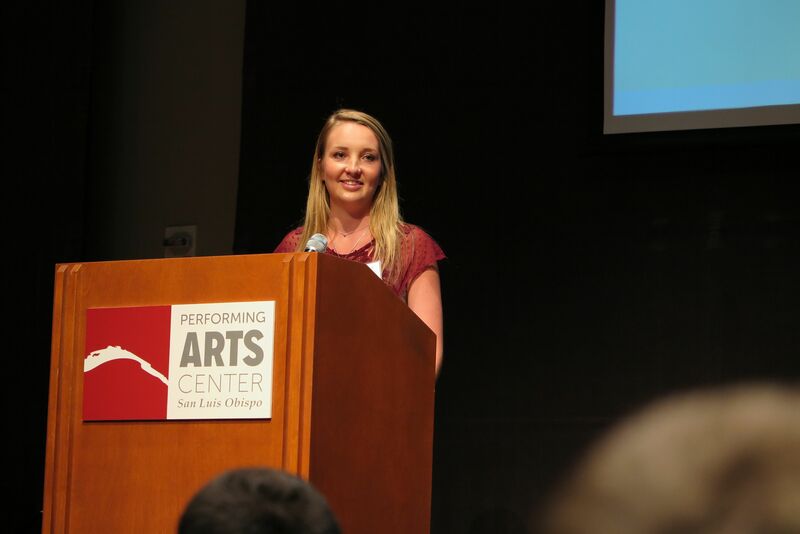 Katherine White, a business administration freshman, won the Audience Choice Award for ClockIn, an app that would use mobile geolocation technology to create a digital time card for hourly employees. 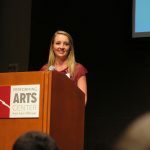 Fourth year Industrial Technology student Katie Boe pitched an app called DingBot that aims to collate and streamline frequently used mobile app functions for quicker access. The competition’s judges awarded her idea 3rd place in the Launch Pad category. The evening’s overall winner was Chad Kihm, an industrial engineering student, for his pitch introducing a suite of mobile game education tools, called “Game of War Real Tips.” He was awarded $1,000 to develop his idea and the opportunity to pitch at the Collegiate Entrepreneurship Organization’s National Elevator Pitch Competition in Florida. Entrepreneurship professor and CIE co-founder Jonathan York led the panel discussion, “From Dorm Room to Board Room,” exploring how successful entrepreneurs transition from a big idea to a successful venture. 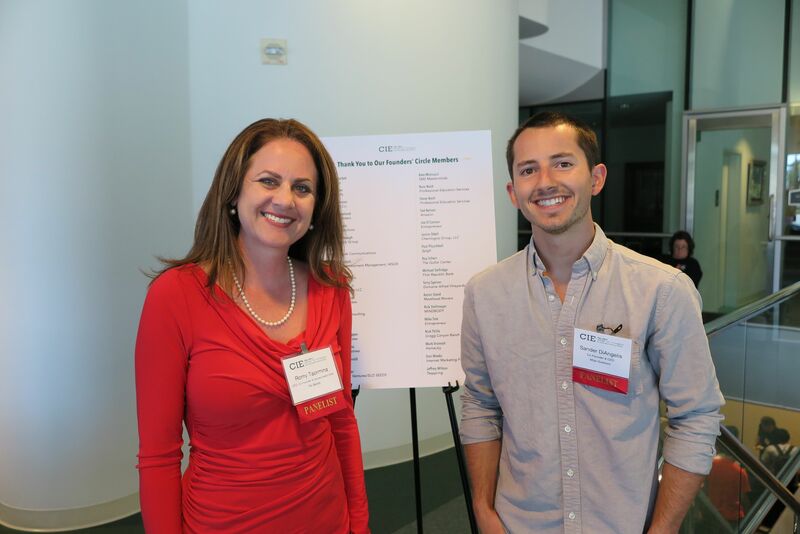 The panelists, who also served as judges in the pitch competition, included two Orfalea College of Business alumni. Sander DiAngelis, a 2014 entrepreneurship graduate and 2013 pitch competition participant, spoke about how his company, Moja Outdoors, benefited from CIE’s HotHouse Accelerator and Incubator resources. Romy Taormina, a marketing alumna from 1993, described her path toward the successful launch of her invention, Psi Bands, to combat nausea in pregnant women and chemotherapy patients. 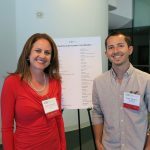 DiAngelis and Taormina joined Alex DeNoble, executive director of the Lavin Entrepreneurship Center at San Diego State University, and Jo Anne Miller, co-founder of SLO Seed Ventures and managing partner at Brown Dog Partners, on the panel. Their discussion ranged from the importance of passion in a startup, to “bootstrapping,” to taking advice from other entrepreneurs. The forum is the first in this year’s series, which will cover topics like entrepreneurship education and finance. For more information on CIE, visit www.cie.calpoly.edu.